Design lamp, inspired by the model Beat Tall of Tom Dixon. Made of carbon steel and aluminium. Carrying cable length: up to 2 metres. 1 Bulb E27 of 40 W (not included). 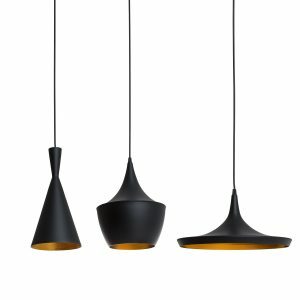 The Beat Tall BRUS belongs to a series of three ceiling lamps that are inspired by the models of the collection Beat of the British Design Tom Dixon. In cement terms, this lamp picks up the contours of the model Tom Dixon Beat Tall. 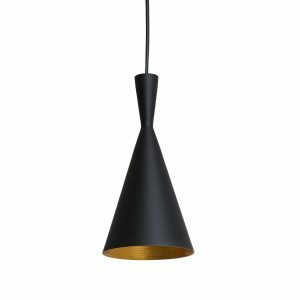 The design of the Beat Tall BRUS stands out because of the contrast of the black steel exterior and the gold interior, inspired by the plastic simplicity of the copper pots and traditional glasses. Its contribution in terms of direct light and the originality so as the exclusive elegance of its design that combines both with classical as well as modern decorations, converts it into the ideal lamp for your dining or living room at home. However, it’s as well ideal for its use in commercial and hotel activities or in any place where you wish a lamp that knows how to transform itself into the authentic space protagonist. 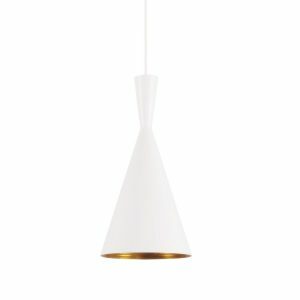 You can use it as a single model or with the other models AMSTI and TRED of the same series that you find in our catalogue. Like this, you can create the combination that best adapts to your preferences and space requirements.